The application process was easy and the additional exams and interviews prior to the procedure were easy to accomplish. Travis ensured that everything was taken care of and any questions that I had were answered promptly. I am so thankful for the work that Travis does and the attention to detail and passion he has for bringing this program to myself and other Veterans. I want to help Travis, Time For A Hero, and everyone involved in this program to be successful in reaching more veterans. Every person I came in contact with was extremely professional and knowledgeable. Everyone was genuinely concerned with providing me the best medical care possible, and helping to alleviate the pain that I had been living with for years. Dr. Burton, the Anesthesiologist, provided a thorough, over-the-phone medical review of my history and the benefits/expectations for Stem Cell therapy. The itinerary was taken care of well in advance of my travel, allowing me to plan for my trip accordingly. This also helped to alleviate any stress related to the trip, aside from a bit of nervousness and excitement for what lay ahead with stem cell therapy. My wife and I are extremely grateful for the travel plans that provided for her to travel with me. Without my wife joining me, my anxiety and list of excusals to cancel the trip would have taken over my thought process as the treatment date moved closer. Mike Bell was the volunteer pilot with Veterans Airlift Command that provided private transportation from our home in Dayton, OH, to Ft Lauderdale, FL. Considering it was the first day of the New Year, it was even more significant the generosity of Mike to share his time and resources in providing support for my wife and I for treatment. Mike genuinely cares about the work he does in support of Veteran’s and I really enjoyed being able to sit as ‘co-pilot’ for our flight, learning more about him and the support work he does for other veterans. Mike is a great person and I am honored to know him. We arrived in Ft. Lauderdale and easily found transportation to our hotel. The hotel was wonderful and dinning was convenient. In the morning we were able to connect with the other veteran and his wife, who was also traveling to Okyanos. It was nice having the same flight and building that connection before arrival in the Bahamas. The arrival into Freeport was smooth, and it was an extreme honor to have Gregg Phillips meet us at the airport. He provided a quick overview of the next three days, and Rochelle had our transportation ready and waiting for us. Our drivers alternated between Adrian and Roosevelt, and they were always on time and extremely professional. Roosevelt was our driver for the Pre-Op, and was able to help us with an extra stop after the Pre-Op visit. The Pre-Op appointment was thorough and a fantastic start to the medical treatment portion of our trip. From the warm greeting of Philipa at the desk, to the introductions of nurses Gretchen and Stephanie, and the thorough review with Dr. Rademaker; everyone made myself and my wife feel extremely comfortable with the groundbreaking treatment program we were embarking on. We consider ourselves very lucky to have been able to enjoy dinner with Gregg and the other couple the evening prior to treatment. It was so nice to be able to learn more about the foundation of the program and where it is heading, while also sharing our perspective on what worked to get us there and how it can continue to grow and reach other veterans/families in need. I was scheduled to arrive at 7 am for my procedure. Our driver Adrian was prompt and we arrived on time. They took my wife and I back to prep; changing into my gown, starting the IV, and reviewing the treatment plan with Dr. Burton, Dr. Rademaker, and the nurses. They answered all our questions and made is feel very much at ease with what was going to take place for the harvesting of Stem Cells and the best utilization of the cells. They reinforced that I was fully in control of how the cells would be applied for treatment, ensuring that I felt my treatment program was maximized for my need. My wife went into the lobby to wait while I was taken back to the OR. The team that greeted me was extremely professional and their attentiveness to myself and the other providers in the room conveyed the seriousness of what was about to transpire that morning. I remember Dr. Burton giving me something that he said might feel cold…and I could feel that sensation creeping across my face before I was out. That portion of the procedure went smoothly and I was soon waking up, back in my recovery room. Both Dr.s and even nurse Gretchen checked on my wife to let her know that the procedure went smoothly and I would be awake shortly. In fact, as soon as I was alert, I was asking for my wife. I felt great! Only some mild discomfort in my abdomen. My total cell count came back as 72 million and I discussed with my clinical team the desire to adjust the treatment focus slightly, putting greater emphasis on providing treatment for my TBI/lung needs. We came to an agreement on how to best disburse the number of stem cells between my TBI/lung needs and joint needs to maximize the results for long term health improvement. Dr. Burton has such great skill that the joint injections were virtually painless, and I could even notice an improvement in my general pain level at the treated site later the same day. I was also able to notice a difference in my breathing ability the same day. My wife and I were provided a nice lunch at the medical center before checking out. Actually, the French onion soup was fantastic and I even finished my wife’s bowl. We were provided an Emergency contact phone for any needs we might have before the follow up appointment in the morning, and then we were driven back to our hotel where I rested a few hours before joining my wife for a walk on the beach and along the marina. We later joined the other Veteran and his wife for dinner again, and shared our stories of the treatment from the day and enjoyed a nice relaxing evening. My post-op was scheduled for 10 am and our driver, Adrian, was prompt as usual. This actually allowed for a quick stop to pick up breakfast before my appointment. The post-op check went smoothly and I was able to report that I needed zero pain medications following the procedure. I was also able to report that it was the first night in a very long time where I had restful sleep. 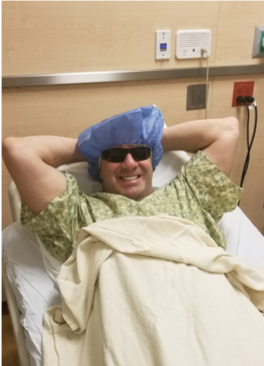 Once again, Dr. Rademaker and the Okyanos staff answered all my questions and ensured my wife and I knew that this really was just the beginning of the healing process that was taking place with the Stem Cell therapy. Simone met with us to review the importance of taking the scheduled Brain tests and evaluations. We thanked her again for all that Okyanos had done for me and our family. Our flight out was later that day, so we had some time to enjoy another relaxing walk and peaceful lunch in the Marina. Everyone in the Bahamas is so friendly, and the atmosphere is relaxing and healing in itself. We joined the other Veteran and his wife at the airport and traveled back to Ft. Lauderdale together. We also joined them again for dinner that evening in FL. It was very nice to have a family to go through this with and have such a great connection with. My wife and I enjoyed a nice breakfast, and another day of continued improvement with my joint, TBI/lung issues. 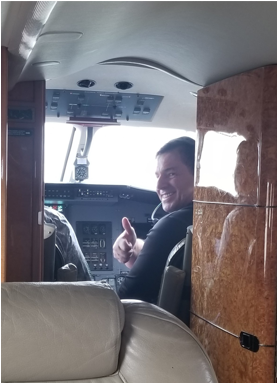 We traveled with the other Veteran and his wife to the private airport where we would connect with Mike Bell again for our trip home. Mike was joined this time with his co-pilot, Adam. Adam was a Marine who lost his left arm in combat, and has not let that slow him down. Another truly amazing human being that this journey with Time For A Hero enabled me to meet. We first flew to Missouri to take our new friends, fellow Veteran/wife, home. We really enjoyed sharing the time with them, getting to know about them and their family, and look forward to staying in touch with them as we continue this journey of healing. It was a quick layover and then we were airborne and heading back to Dayton, OH. We were so thankful again for Mike to take time away from his family on another significant day to provide support for Veterans. Even though Mike’s daughter was arriving home that same day after not seeing her for almost a year, he took time to make this experience as smooth and as memorable as it could be. I do not think I can say it enough; I am so thankful, grateful, humbled to have been chosen for this transformative treatment program. Absolutely every person that myself and my wife have come in contact with through this journey has been extremely gracious, kind, professional, and passionate about providing the best care/assistance they can to me and my wife. This means more to me than I can properly convey in words. Please extend my sincere gratitude and that of my wife’s to everyone involved. Please share my story as much or as little as you would like to help in promoting the amazing work being done through Time For A Hero. I am available to answer any questions that another Veteran may have prior to applying for treatment. I am also available to share my story with anyone who is interested in donating in support of this program. This is transformative and I will help any way I can. My wife is also standing by to assist in any way she can, answering questions or sharing our story with other caregivers or donors as well. Thank you Travis. Thank you so much for what you have given to me and my family.